Call it the Facebook World Tour. Even though Facebook is now the largest social network in the world,—with 132 million unique visitors in June—it is also still the fastest growing. (At least among the major social networks). According to figures compiled by comScore, Facebook’s visitor growth is up 153 percent on an annual basis. 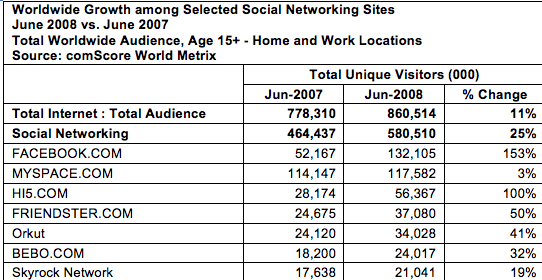 This compares to anemic 3 percent growth for MySpace. Other social networks showing strong global growth include Hi5 (100 percent) and Friendster (50 percent), despite each of those being less than half the size of Facebook. 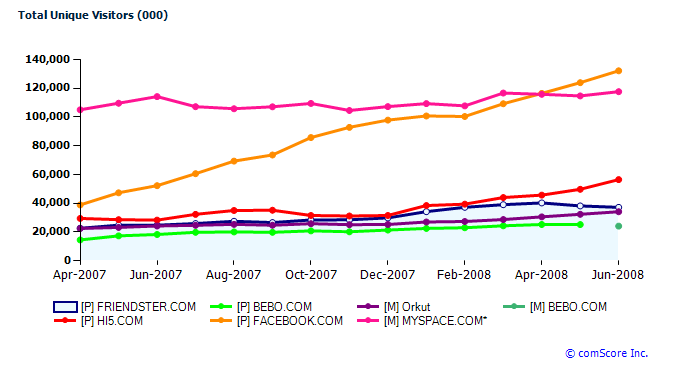 Orkut and Bebo fall in at 41 percent and 32 percent growth, respectively. Much of these huge growth numbers come from the fact that Facebook had hardly no presence in many of these regions until recently when it started its major push to translate the site to other languages. A year ago, it had only one million uniques a month in all of Latin America, three million in the Middle East and Africa, and four million in all of Asia Pacific. When you look at it that way, 10,555 percent growth isn’t as amazing as the raw numbers would suggest. And within these regions, it still has a lot of work to do. For instance,it is floundering in Japan. The takeaway here is that Facebook’s growth is now coming from abroad, and it still has a long way to go in other countries. Will it get lost in translation, or are we looking at another global superpower here?